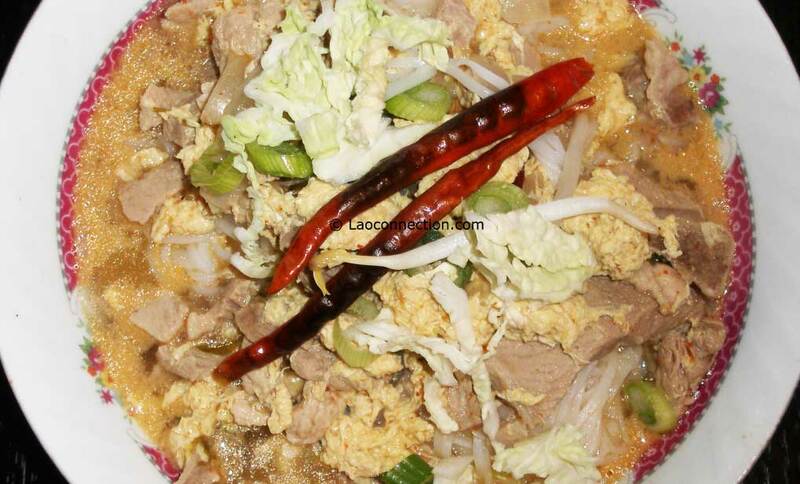 Laoconnection.com: Mee Ka Tee - Most Awesome Lao Soup! Most awesome? Or perhaps just my favourite... :) As a kid I used to call it mee ka teekerzzz! 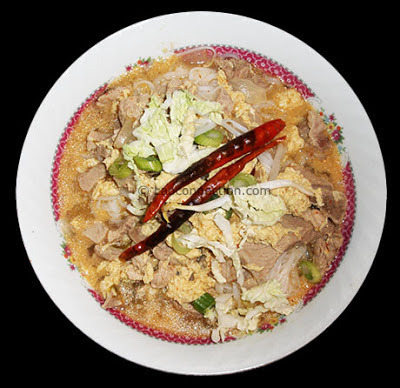 Mee ka tee is essentially a coconut milk, pork, red curry soup. When I was young, I once had this Lao soup dish that a family friend had made. I loved it so much that I mentioned it to my mom and asked that she show me how they made it. I forget how old I was exactly but definitely around my pre-teens. Indeed it would become one of the first Lao dishes I ever learned how to make. In fact, I often attribute this dish as to why I started cooking Lao food on my own from an early age. To this day it's still one of my faves. Here's our recipe. I guarantee you'll love it. And don't be intimidated by the amount of ingredients and steps, it'll all be worth it in the end. 1-1.5 lbs of pork meat (seen mu). Can be either ground meat (seen moon mu), 3 level pork (mu sam sun) which is the one with meat, fat and skin/rhine all in one piece, or ribs (kadook kang mu). 1 package of rice vermicelli noodles (the same ones used in vietnamese pho). Optionally, most rice based Asian noodles will work with this soup base. Believe me I've tried it! It's even good just with rice if you don't have any noodles. Place a soup stock pot (6-8 quarts sized) on the stove, fill it with water 2/3rds of the way and bring to a boil. While that's boiling, throw in the fragrant ingredients, namely cilantro root (save the stem and leaves for later garnishing), galanga, kaffir lime leaves. Then add your desired pork meat to the boiling pot. If using 3 level pork (mu sam sun) be sure to cut it into bite sized pieces and if using pork ribs be sure to cut the ribs up. Or you can use medium ground pork. Leave that to boil on medium-high heat for at least 10 minutes and proceed to #2 Flavor Base. Note: Be sure to occasionally spoon around the edges of the pot to get the foam gunk that floats to the top. While stock is boiling, heat up a separate deep pan on medium high (deep enough to hold the liquid of the 2 cans of coconut milk). Add the 1 tablespoon of oil. Once that's hot, throw in the chopped shallots, chopped garlic and red curry paste. Stir it up while it's cooking. After it comes together nicely, add the 2 cans of coconut milk. Continue to stir a bit more and ensure it becomes a nice homogenous liquid. Let cook on a low heat for 5 more minutes. After the initial stock has been boiling away for approx. 10 minutes and you've had a chance to spoon away the gunk that floats to the top, carefully pour this flavor base liquid to the stock pot. Stir it in thoroughly. Beat 6 eggs and carefully pour into the stock pot. Slowly pour with one hand and stir the pot with the other simultaneously. You don't want chunks of cooked eggs, you want threads or long strings of it in the final product. Add the sugar and fish sauce. Adjust the amount to your taste and liking but start out with the amounts we've indicated. Add the peanuts (optional and can be left out for those with peanut allergies). Leave to boil on low-medium for at least 1 hour or more. At the very least until the meat is completely tender. 4. Garnishes - Vegetable garnishes are key to any Asian soup. Can't forget that! Whichever ones you use are up to you. Below are suggestions. Finely chop the cabbage so it gives it the shredded appearance. Shred the carrots, chop the cilantro and green onions. Mix all these veggies plus the beansprouts together, then set aside. Cut up some lime wedges too. In a separate smaller pot with water, boil the vermicelli noodles until they're tender. Then remove them from the pot and place in a strainer. To keep the noodles from sticking together you can stir in 1-2 tablespoons of oil. Place a desired amount of noodles in a deep serving bowl. Ladle in the broth with plenty of meat too. Top the soup with a handful of all the veggie garnishes you just chopped along with some some mint leaves. Squeeze a lime wedge over all of it. Done. Enjoy! Optional: Enjoy with a couple of dried chilli peppers (shown below). The great thing about mee ka tee is that it's one of those soups that tastes even better the next day. The flavors become more concentrated and the broth thickens up a bit more. If you want a healthier version of this, use lean ground pork. If you eat this after only an hour or so of cooking you'll notice it's a bit spicy from the red curry paste. However if you cook it longer the spiciness dissipates. Thank you for posting this recipe. Made this today and it was delicious. Just wondering, what do you do with the 1 cup of peanuts? Sabaidee! Glad to hear you made this recipe. With the peanuts you can put them in while the soup is boiling away, let's say at step 3. In fact, I've added that now above in the instructions. Thanks for mentioning it. What's the serving size on this dish? The serving size is as much as you want. But generally when placing the rice noodles into the bowl, it's usually a single hand full (can be more for those with bigger appetites). How long do you boil the initial stock before adding the flavor base? I would suggest boiling the initial stock for around 10 minutes on medium-high heat before adding the flavor base. Why? Because during those 10 minutes the foam gunk that comes from boiling meat will rise to the top. You'll want to spoon that gunk away before adding the flavor base. Hope that helps. I'll add this note to the main instructions above. Thanks for the question. How much water did you use or how large is your stock pot? For this recipe my mother and I have used varying stock pot sizes but they were always in the range of 6-8 quarts. The end results were always similar. Of course, the flavors are more concentrated using a smaller pot (as there is less water yet the same amount of flavor base used in the recipe). Hope that helps. I will add this to the main recipe above. Thank you for the question!